Fourth eight days ago in the Grade 1 Santa Anita Handicap at Santa Anita Park in Arcadia, Calif., Woodford Racing's Campaign, who was about nine lengths off the lead when the field crossed the finish line for the first time in Sunday's Grade 3, $100,000 Tokyo City Cup, rallied five deep turning for home en route to an impressive 3 ¼-length victory. Trained by John Sadler, Campaign got the marathon mile and one half Tokyo City distance in 2:34.73. Originally based with trainer Steve Asmussen back east, Campaign, a 4-year-old colt by Curlin, out of the Dynaformer mare Arania, was off at 5-2 in a field of five older horses and paid $7.00, $3.20 and $2.20. “I had a lot of confidence in this horse today, because I've ridden him in his last two races,” said Bejarano. “In the Big 'Cap (Grade 1, 1 ¼ miles on April 6), he didn't have any pace to run at. Today, he was very relaxed and he was full of run going into the far turn. I didn't want to try and go inside, because I know this horse likes to make a run on the outside. With today's win serving as his first stakes win, Campaign has now won two out of his three starts for Sadler and his overall mark stands at 8-4-1-0. With the winner's share of $60,000, Campaign now has earnings of $310,253. 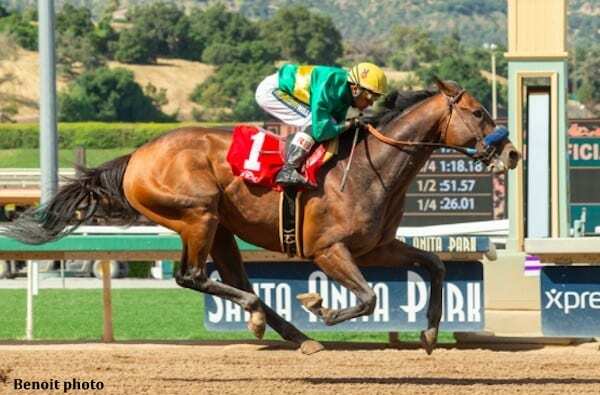 This entry was posted in Racing and tagged Curlin, Dynaformer, john sadler, rafael bejarano, santa anita, tokyo city cup, woodford racing by Mike Willman/Santa Anita. Bookmark the permalink.